Other Ingredients:xylitol, sorbitol, cellulose powder, stearic acid, silicon dioxide, natural flavors, ascorbyl palmitate, beet juice, citric acid. Vitamin D2, a common form of vitamin D known as “ergocalciferol,” is less well-utilized because it must be converted to vitamin D3 by the body. Supplemental vitamin D3 typically shows much better use by the body than vitamin D2, because it doesn’t require this extra step. Can’t I just get vitamin D from sunlight? Even though our bodies do synthesize vitamin D3 following exposure to sunlight, most of us don’t spend enough time outdoors for this to happen regularly and for any sustained benefit. In fact, vitamin D3 levels are a major concern for individuals living in the northern latitudes, working indoors, or with darker skin. 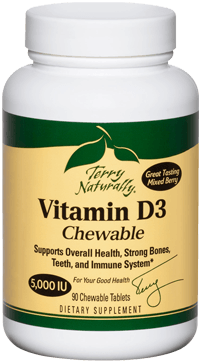 Having a reliable and convenient supplemental source of vitamin D3 simply ensures that you get the levels you need. What is the source of vitamin D3? The source of vitamin D3 in this supplement is lanolin from sheep’s wool oil. The sheep are not harmed during the process, it is simply a co-product of the shearing and wool-producing process.